Super long fashion post, finally!! Anyways, I like a lot of things this spring 2011 But I'm not exactly wow'd or completely in love with anything. That really surprises me because I mainly like to describe fashion things in terms of "I love this, or I love that"! haha. Fashion week, or the designs have really been a let down for me. I'm still looking for them and I didn't want to make this post too long. So I'll keep posting the things that I do find. So far, I like funky prints, the different and tube like necklines. And I love that some knit/crochet pieces are coming back into popularity, not many of them, like vests, and a cover up type top. But still enough to motivate me to start knitting! What do you guys think about the spring 2011 collections? 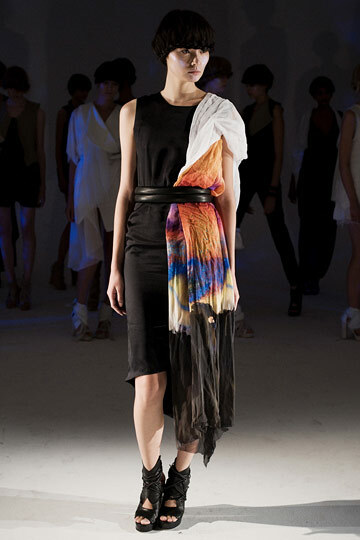 I was really taken with the Mara Hoffman collection (and I love the images of it you collected)! i love adam's second dress - its gorgeous !! i love the colors and layers - and the sleeve ! this is just brilliant! words cannot say how much i just adore these wonderful oufits. You definitely picked out some inspiring looks! I really like the third dress. It's so colorful and flowy! this is a great show !! im loving all the airy dresses ! the prints are beautiful too ! I love (with big letters) the second outfit. I love Fashion Week and getting a peek at what is to come in the fashion world!